A friend and prize winning poet introduced me to the Octain, a new form created by poet, Luke Prater. Writing poetry to a specific form can be quite daunting and challenging but that is part of the fun. A trip to the brain gym is good exercise and hopefully if done often enough will show some results. I do not like obscure poetry but I do worry sometimes the things I write are t00 personal and are not experiences generally shared (thank goodness), so I will explain this one by saying it is a mother talking to her adult autistic son. If written entirely true to Luke’s form, I think this High Octain should read as one complete stanza. I have broken it into four in an attempt to help comprehension. I hope he will not mind. to try and make you be aware. You would not know, it was unsaid. about the burden on your head. and understand the world we share. across my life with kindly care. Was it a burden on your head? Summer is threatening to close in with alarming speed; temperatures are dropping, the days shortening and some trees are showing an autumnal tinge. A group of us have managed our Poetry in the Garden workshop with tutor Sally without a raindrop splashing the page. We think this is down to Sally who has placed an order for fine weather every week. We have been led through the Haibun, the Villanelle, Tercets, Pantoums, Rondeau, Triolet and Octain. Sally asked if I’d lost weight and I admitted just two or three pounds but I think I’ve discovered a new diet. It’s the ‘Poetry Diet’. I’ve decided mental gymnastics require as much energy as the treadmill at the gym. The discipline of trying to keep to form, make sense when repetition of rhyming words or refrain are used is difficult. This is not helped when we read published poets who break all the rules and seem to get away with it. But I suppose it’s like anything, the more you practise, the easier it becomes. Last week we tackled the Rondeau. For a moment I was challenged by the idea of a Rondeau Redouble but chickened out at the last moment with the following. embroidered socks are here to stay. Charlie Green is down there waiting. He says, ‘You don’t have time for coffee’. ‘You’re just lazy,’ he says. I know I’m being sensible. How will I find time to write my book if I have to pull every weed and chase every greenfly? That’s supposed to be his job. He wants to return to his seat beneath the Amelanchier. It’s closer to the house and he can keep a eye on what we’re doing. I’ve offered to make him a tisane with homegrown Feverfew to soothe his stressed brow but he says he’d rather have a gin and tonic. I didn’t like to tell him it would be a waste on a person of his composition. Besides, I’m saving that for me! Such a hot afternoon but how could we complain! We were surrounded by paintbox coloured blooms. Fragrant lavender and crocosmia bordered the house while nasturtiums rambled onto the patio trying to get in on the act. This afternoon we were going to attempt the Haibun – not in classic Japanese style but as close as we could manage. There are several ways to write this but the simplest is a piece of prose followed by a haiku. There has to be a link between the two. The haiku is not an extension to the prose but each has to add meaning to the other. We were each given a mystery word and invited to use something found in the garden to write our haibun. It is an interesting format. I had seen this girl before. Tanning parlour beauty, too quick to lose her butterfly bikini, given the right incentive. 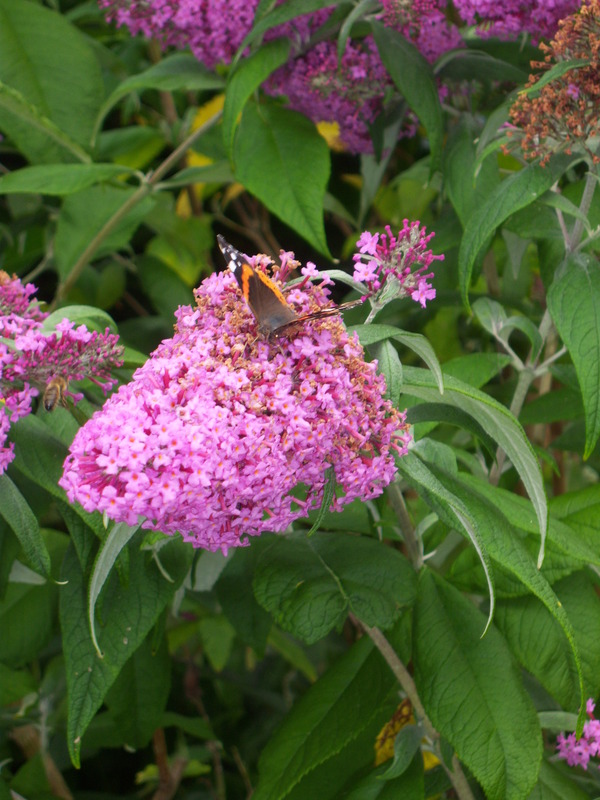 I traced the flight of a Red Admiral across the garden until it settled on a buddleia bloom beside the slapping waters of the swimming pool. Its painted wings pulsed as it probed each virgin flower for nectar. This butterfly moved on. I was lucky enough to draw the word ‘despair’ – not usually a word I associate with the garden unless we’re unlucky enough to suffer a gale or very cold winter. The fields were empty of horses this morning – the animals are in their summer pastures below and only the butterflies danced across acres of creamy yarrow before the tractor comes to make hay. Yarrow is a weed but there’s something about wildflowers – the chaotic way they spread their blooms given the chance and yet the effect they produce is usually just as good if not better than any professional gardener. The yarrow drifts across the tall grass like thin clouds streaking a summer sky. drawn in by the wild bouquet. more gentle than a baby’s breath. and in a blink move on. before the hay was made. The early morning promised a good day. An opportunity to start afresh. To leave depressing world news to those that have the power to do something about it. My four-legged friend and I set off for the woods. She doesn’t do energetic walks these days, so I wander behind puzzling over what can smell so good down at her level. The lush dew damp grass was inviting on our approach. I could have easily thrown off my walking boots in favour of a barefoot stroll if it weren’t for the prospect of snakes lurking in the undergrowth. Then peace was shattered. High in the green canopy of sapling oak and birch trees, a battle had broken out. We stood and my eyes strained through the branches to locate the rasping crows. War had broken out. Feathered carrion jets had begun an intense attack on a tawny owl. He sat ducking with each onslaught as it came in from different directions. I can only think he was a young bird who had not long learnt how to fly and was not quite sure how to deal with this attack. Apparently they depend on their parents for up to three months. Then the alarm call of the blackbird joined the feathered cacophony. At last some wisdom dawned and the owl spread his wings in search of safety. The villains winged it also to hunt for another victim while the blackbirds continued policing the trees a little longer. Whoever thinks life in the countryside is quiet and boring, should think again. Reminder of a very different past summer. lit only by a low wattage moon. are flung open with abandon. 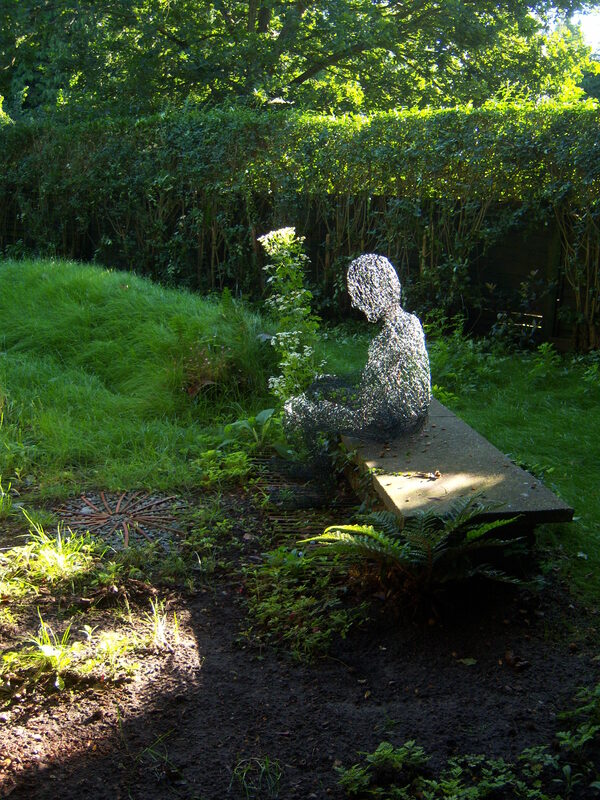 sit unmolested, watch our passing feet. in games of vocal volley ball.